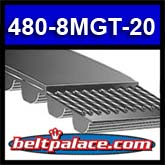 480-8MGT-20 GATES PowerGrip GT3 Timing Belt: 18.9" Length (480mm), 60 Teeth, 8mm Pitch, 20mm Wide. The 480-8MGT-20 GATES GT3 Features Fiberglass tensile cords providing high strength, excellent flex life, and high resistance to elongation. Excellent for CNC machines, power tools, and motorsports applications! 480-8MGT-20's Nylon tooth facing provides a durable wear surface for long service life. 480 8MGT 20 has Gates' patented tooth profile is designed for use with a specific sprocket groove profile. The sprocket groove-belt tooth combination increases capacity, while improving registration.